We present the January 1960 issue of the short lived, but influential periodical The The Jazz Review. 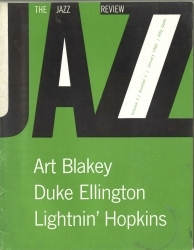 This Rare publication includes articles by some of the most important and significant Jazz critics of all time, including Martin Williams, Nat Hentoff, Stanley Dance, and Gunther Schuller. This issue features articles on Duke Ellington, Art Blakey, and Lightnin' Hopkins. A true piece of Jazz history from the golden age of the music. January 1960, Vol. 3, No. 3.